There are a lot of super geniuses out there in cartoon land. Although I do love them, I feel more at home with the less intelligent and the stupid folk. (I can’t imagine why.) I tried the science thing for a while and turns out, it wasn’t for me. It would be nice to have the brain power to invent gadgets and elixirs for the betterment of mankind. (Or at least myself.) Yeah, I’d probably make most of my stuff for the wrong reasons and end up doing more harm than good. Kind of like the disastrous combination of the Test kids. Just like Johnny, I’d run to the Lab whenever I have a problem, use something that I’m probably not supposed to, and destroy half of my city. I know it’s wrong, but it really does sound kind of fun. And Johnny’s daily life frequently includes a bunch of villains bent on his destruction who are a lot more misguided than evil. And they love a good competition. See, even more fun. Burrito Fixings- Cheese, Refried Beans, Etc. (Optional) I tried plain, with cheese, and bean and cheese, and they were all yummy. Heat 1 tablespoon of vegetable oil in a small skillet over medium heat. Add onions and peppers and cook until soft and onions are translucent. Add garlic and cook for 30 seconds. Remove from heat and set aside to cool. In a large mixing bowl, combine the egg, bread crumbs, milk, ketchup, Worcestershire sauce, salt, pepper, cumin, chili powder, and parsley. Add the vegetables and meat and mix until combined. Transfer the meat mixture to a parchment-lined pan. I chose a 10 X 10. Shape the mixture into a loaf and bake for 20 minutes. Make the glaze by combining ketchup, mustard, and brown sugar in a small bowl. Brush the meatloaf with the glaze and bake another 25 minutes or until the meatloaf’s internal temperature reads 155-160 degrees F. Remove the meatloaf from the oven and allow to cool for 10 minutes. Cut the meatloaf into 6 slices. Break up a slice and spread over a tortilla, along with anything else you want to add. Fold the sides and roll up the tortilla. Repeat with the rest of the meatloaf slices. Heat vegetable oil in a large skillet over medium-high heat. Lightly brown the burritos on all sides and serve! Johnny’s dad was really on to something with the whole meatloaf burrito idea. And mine don’t stink at all! Even my anti-meatloaf sister enjoyed her’s. Too bad, because then there’d be more for me. Now just because I made a yummy meatloaf, doesn’t mean I’m going to eat one every day. That’s where poor Hugh messes up. As for myself, I think I’ll have spaghetti for dinner. Fairy Godparents who grant just about any wish I ask for? Sign me up! Alas, I couldn’t get my own fairies because I had quite the happy childhood. (Stinks, right?) So I’ll just sit here and seethe with jealousy as I watch Timmy Turner adventure with the magical beings I so rightly deserve. Ew, I’m starting to remind myself of Mr. Crocker. Well, at least I’m not as bad asFAIRYGODPARENTSFAIRYGODPARENTSFAIRYGODPARENTS!!!!! Ouch. Maybe I spoke too soon. Come on. 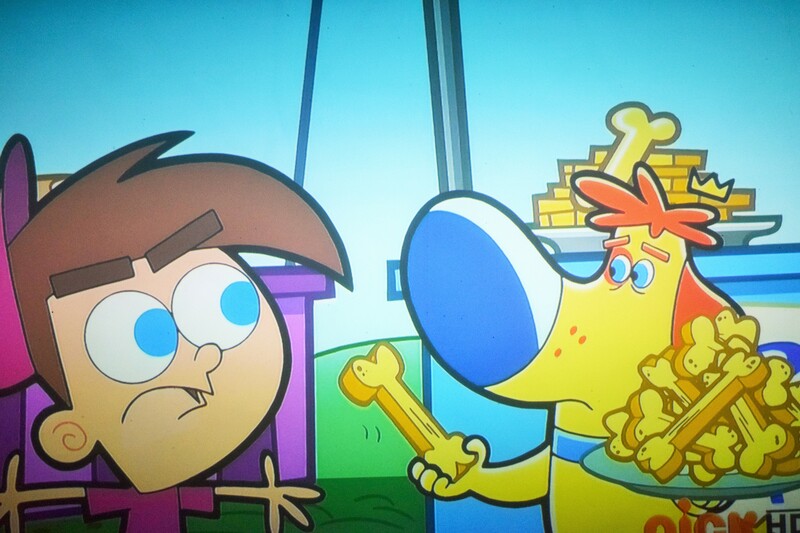 Timmy even has a fairy dog who bakes! I love my dog and wouldn’t trade her for all the magic in Fairy World, but she’d rather steal my food than make some herself. Sparky, on the other hand, makes “magically delicious” dog treats that are so addictive that Timmy’s Dad ate a million of them. I don’t know about dog treats, but I do have something that might do the trick. Recipe makes roughly 15 spark tarts. It can vary by the size of cookie cutter used. Mine were stubby! turbinado/raw sugar or additional white granulated sugar – Optional, but it makes it sparkly! Combine flour, baking powder and salt in a medium bowl. In a stand mixer, cream together shortening and sugar on medium speed. Reduce the speed to low and add the egg and vanilla. Add the flour mixture a little at a time, alternating with the milk. Remove dough from stand mixer and flatten into a disk. Wrap in plastic and chill for 1 hour or until firm. Roll the dough out to a thickness of 1/4 an inch. Have some flour on hand because the dough will start to get sticky as it warms up. 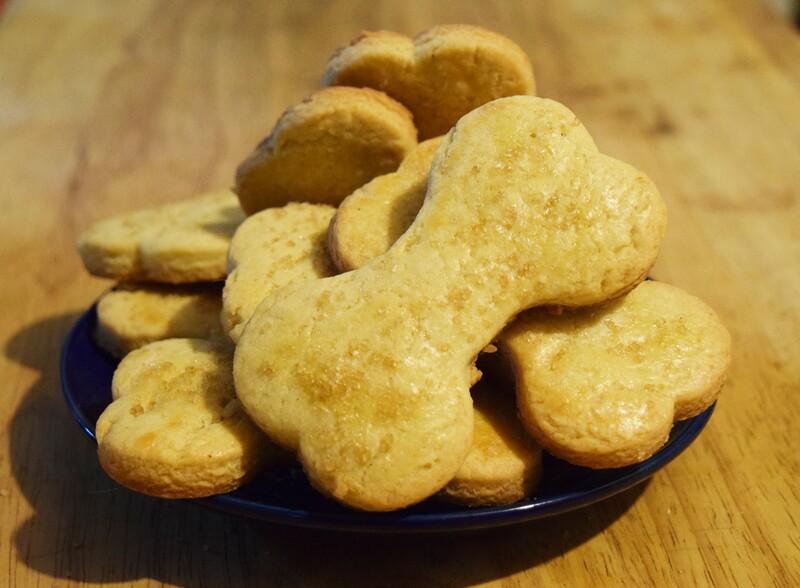 Cut out shapes with a doggy bone cookie cutter and place on parchment-lined baking sheets. Roll out scraps and cut out shapes until you run out of dough. Chill Spark Tarts for 15 minutes to help them retain their shapes while baking. Make an egg wash by whisking together one egg and a tablespoon of milk. Brush the Spark Tarts with the egg wash and dust with sugar. Bake for 25 minutes or until the edges begin to brown. Remove and transfer to a cooling rack. Then stuff your face! These Spark Tarts are pretty yummy with a nice, big glass of milk, even without the secret ingredient. I didn’t have any fairy dust on hand, but if you have some lying around, feel free to add it. I probably could eat a million Spark Tarts, but the only thing I’d wish for afterwards would be to have my stomach pumped.